The ashes of this month’s Ballymacash bonfire barely had time to cool before organisers were laying plans to make next year’s event even bigger and better. It’s a tall order, though, for the Ballymacash Cultural Awareness Project, to build on this roaring success. Planning is done in consultation with a community for whom the traditional July 11 bonfire has become ‘the’ highlight of the year.Said Brian: “ The bonfire is very definitely an annual highlight; it keeps getting bigger, better, stronger and more organised.” The work that goes into it includes fundraising events, complying with legal requirements, making sure no tires or household rubbish make it onto the pyre, providing toilet facilities and providing safety marshalls and barriers. There’s a lot of work too in the fun day, with a water-slide, magic show, face-painting, bouncy castle, kids’ party, vintage military vehicle display, and souvenir stalls. Among them, he said, were local traders and residents who brought food to people keeping watch because fires were being burned ahead of time. He also thanked the community police, Windmill Stores, Man Lee Chinese Takeaway, Pride of Ballymacash Flute Band, local pensioners and band, Pretty Cartel. In the Star dated we carried a report on a Confederate flag being erected on the Knockmore Road. 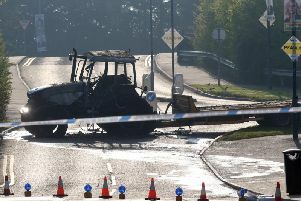 The report also carried a phot0 of the Ballymacash bonfire. The Star would like to point out that the bonfire was cited only as a local reference point. The was no intention to suggest that anyone associated with the bonfire was in any way responsible for the erection of the flag and The Star would like to apologise if this impression was given.